A recent Financial Times Group thinktank may have claimed that Gujarat turned into No 1 Foreign Direct Investment (FDI) destination among all Indian and Chinese states (see Counterview, April 22), Government of India’s (GoI’s) own FDI data show that, far from being No 1 among the two countries, it is No 5 in India. While the thinktank, FDI Intelligence, gave the figures of FDI intentions, pointing out Gujarat "attracted $12.4bn and claimed 10 per cent of all capital investment into both countries", pushing Shanghai Municipality (China) to the No 2 position with an investment of $10.57b, the GoI figures show that Gujarat has remained consistently No 5 since 2000 in India. 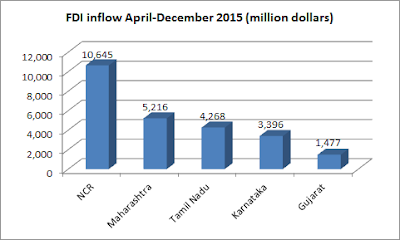 The quarterly factsheet, released by the GoI’s Department of Industrial Policy and Promotion (DIPP), shows that FDI inflow into Gujarat was $ 9,507 million between April and December 2015, which is five per cent of that of India’s $191,063 million. As against Gujarat’s 4.97 per cent of FDI inflow, Greater Delhi’s or National Capital Region’s (NCR’s) was found to be 36.18 per cent (or $69,129 million) that of the country, followed by Maharashtra 17.66 per cent (or $33,756 million), Tamil Nadu’s 14.66 per cent (or $28,023 million), and Karnataka’s 11.45 per cent (or $21,883 million). The quarterly factsheet, significantly, provides actual FDI inflow data as against the global thinktank FDI Intelligence’s data on what is often called “committed” or “intended” investment, which may or may not fructify on the ground level. 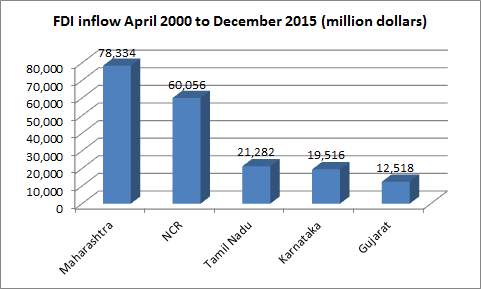 What is equally interesting is that, the cumulative FDI inflow between April 2000 and December 2015 also shows that Gujarat has remained No 5 throughout. With a total FDI inflow of $63,304 million (or five per cent of the total) during the 15-year period, Gujarat remained No 5. In cumulative investment during the 15 years, Maharashtra has been found to be on the top, with an investment of $386,778 million (29 per cent of India’s), followed by NCR’s 318,153 (22 per cent), Tamil Nadu’s $116,790 million (8 per cent), and Karnataka’s 104,004 (7 per cent). It had added, despite Gujarat overtaking all other states of the two countries, “Maharashtra in western India remains one of the strongest performers across the years and it has continued to close the gap on the top Chinese destination, Shanghai Municipality, with the locations attracting $8.3bn and $10.6bn, respectively, in 2015." Interestingly, the thinktank, in a separate analysis did not find India’s topmost business capital, Ahmedabad, or for that matter any other city, figuring among Asia-Pacific region’s top ten FDI job creating cities.